Ashford in the Water is a really beautiful place in the Peak District situated on the River Wye between Bakewell and Buxton and houses two pubs, a corner shop and a post office. The Ashford Arms Hotel is an 18th century coaching inn and the Bull’s Head known as the Turk’s Head in the 19th century has been run by the same family since the 1950’s. The corner shop has been in existence for over 100 years. The main attraction is the ancient Sheep wash bridge which was originally a medieval packhorse bridge and is also a good place for watching rainbow trout swimming in the river. Lead mining was the main industry until the late 19th century but was also known for ore mining, first quarried in 1748, by Henry Watson, which is Ashford marble a unique limestone. When polished the black marble was a perfect background for mosaic and inlaid patterns and the factory closed in the early 20th century. Another industry, that survived, was that of candle making which now stands on the site of the old factory called “The Candle House”. Up to 40 years ago the well dressing, of the six wells in Ashford, was homage to the abundance of water. This was done by layering petals, leaves and natural objects into a bed of clay to form an impressive picture. Deep Dale is a fine example of a Peak District dry limestone dale, with a wide variety of wildlife, flora and fauna and is recognised as both a Site of Special Scientific Interest and a Special Area of Conservation. The grassland is lightly grazed by cattle, which helps to maintain the special flora and also for a large number of butterfly species. Monsal Dale is a valley formed from an uplift of limestone in the centre of the sandstone and shale’s, having long ago been under water, known as the Derbyshire Dome or the White Peak. Monsal Dale is also a Site of Special Scientific Interest, a Special Area of Conservation and part of a Europe wide network called Natura 2000. The Headstone Viaduct was built in 1863 by the Midland Railway, over the River Wye, immediately after the Headstone Tunnel, travelling north from Great Longstone and was seen as destroying the beauty of the dale. The viaduct known as Monsal Dale Viaduct is 300 feet long with five 50 foot span arches which are 40 feet high in the centre, at first there was some slippage and remedial work was carried out in 1907-1908 and a preservation order was placed on it in 1970. The closure of the tunnel and railway came about in the late 1960,s and as from 2010 work is being carried out to reopen the tunnel as part of the Monsal Trail. The viaduct is already part of the Monsal Trail and is a “listed” structure. The Monsal Trail is approximately 12.5 miles following the former Midland Railway from Blackwell Mill to just beyond the former Bakewell Station. The Monsal Head Hotel, restaurant and Stables Bar at the top of the dale overlooks the incredible beautiful views of Monsal Dale to the left and Millers Dale in front. There is ample parking here too if you only want to admire the views. 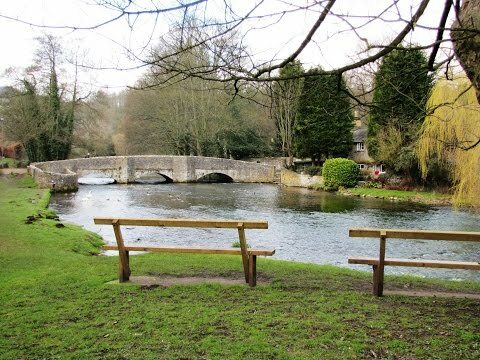 We park near the mill and bridge in the village of Ashford in the Water and walk along the A6 towards Buxton, for a short way, and take the small road on the left signposted Sheldon. Then we take the footpath on the right just after the remains of an old mill and go through the gate then over to the next gate and take the right hand path and follow the River Wye. We pass two mill buildings on the left, a bridge on the right and then a large weir and carry on forward going through the wood. Look to the right behind you and you will see the fish ponds. We come to a footpath sign with Sheldon going up the steep steps on the left but we head forward going uphill and downhill until we come to a beck and a stile in a wall. We go over the stile and head downhill to Deep Dale Nature Reserve and then on to car park at Marie Ann Grace Wood. We then cross the road through the wall stile and down to a stile. We carry on following the River Wye through Monsal Dale passing a footbridge and a weir until we arrive at the base of Monsal Head Viaduct. As we walk through Monsal Dale we come across Mandarin Ducks, Teal, Cutes, Moorhens and a Grebe. Here we bear to the left to the top of the viaduct. At the top we turn right over the viaduct and take the path just to the left of the tunnel entrance and follow the path until we reach a t-junction and a stone bench with an inscription on it. We turn right up to the top of Monsal Head and the Monsal Head Hotel and car park. After admiring the views we take the path that follows on from the path we came up on and when we reach a footpath sign we take the right one towards Ashford. We follow the path until we reach two seats and go through the gate on the left though the wall. We then follow the track forward then left then right and then passing the track on the left we carry on forward until we arrive at the road. Here we turn right and walk down towards the village. At the junction, there is a sign for the car park and toilets but we head down to the river and monument. Here we turn left passing the church and the Bulls Head until we come to the corner shop and the Ashford Arms Hotel. We turn right and cross over the main road (A6020) and take the footpath opposite back to the bridge and mill where we parked our car. Ashford in the Water is in the White Peak District of the Derbyshire Dales, Derbyshire. Ashford in the Water is situated on the A6 between Bakewell and Buxton. There are public toilets in Ashford, Deep Dale car park and also at Monsal Head. For refreshments there are two pubs, The Ashford Arms Hotel and The Bull’s Head and also a corner shop in Ashford and The Monsal Head Hotel and a cafe at Monsal Head. We live in York, Yorkshire and do’nt know Derbyshire that well. We just drive down, get the map out and just walk what we think. The only walks in Derbyshire we can recommend that garantees no cows but is a very beautiful walk is along the lengh of the dismantled railway line the “Monsal Trail” which is also a cycle route. or you could walk from Monsel Head in the opposite direction to Blackwell or vice versa. For other walks the visitors centre in Bakewell might be of help to you.